Wash and cut potatoes into wedges, do not peel. Dry potato slices on paper towels. In a large bowl toss potatoes with Mrs Dash seasoning, olive oil and garlic. Spray baking sheet with non-stick cooking spray and lay potato wedges on sheet. Bake in oven for 20 minutes. 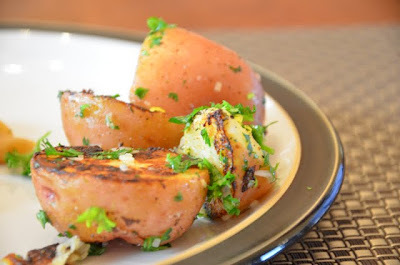 Turn potatoes over with spatula and bake another 15 minutes until the potatoes are browned and tender. Recipe from ? ?… Sent to me by my Mom!